That is what you should be looking for. A marriage of the unlikely wedding partners. My kids, like most kids, have a sixth sense that allows them to detect any attempt at parental lecturing... and then the brain switches off. You can detect that look in their eyes. 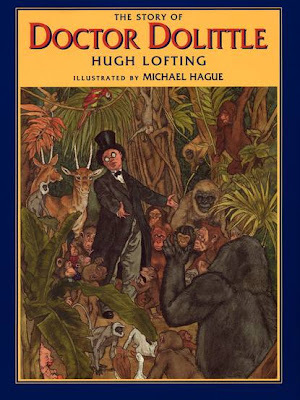 I still remember when I read aloud the the title of this book to my three-year old twins - I saw THE look. They were going to switch off. That sixth sense allows them to unmistakably detect when a "lesson" is about to be delivered by a grown-up and kids start shutting down their channels of communication. You have around 30 seconds before you lose them. Manners Can Be Fun - the title of Munro Leaf's classic (published originally in 1936!) - may start to ring alarm bells in the heads of children as soon as it is vocalized. But, fortunately - their little minds are also totally confused because the electric yellow cover of the book and kid-like sketches at the same time scream "Fun, Fun, Fun!!!" Yes, this little gem is a double agent that works for you. Its simple and oversized, out-of-proportion, drawings serve to motivate the Trojans (children) to pull the horse into their happy little city as a victory trophy. They stand no chance and Munro Leaf knew it. In my house it became a festival of laughter and fun (during our second read-aloud sesion) when the kids got to know Leaf's characters such as the Noiseys, Mefirsts, Pigs, The Snoopers and the Whineys. Jolly times in the bedroom ... and during the process valuable lessons on proper behavior are being learnt. Your children will squeal with laughter when the see their own mistakes being perpetrated by other fictional characters and this makes the message stick. 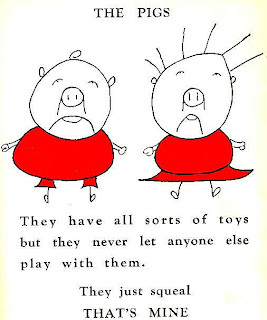 "The Pigs have all sorts of toys, but they never let anyone else play with them. They just squeal THAT'S MINE!" It's a fine line between sermon and fun instruction. Manners Can Be Fun works excellently as a great first instruction on good manners for kids who need an unbiased source (not mom or dad) on the topic. They will appreciate your effort to find an engaging book, instead of delivering another lecture about why you should not stick the bubblegum under the table. My experience is that this approach will also yield better results, as children tend to remember a message much better if it is visualized. Especially if it is visualized in a funny way. So, why not have fun and learn? 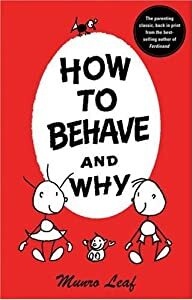 The good news is that Manners Can Be Fun is just one of a series of books on useful topics (for parenting!) by Munro Leaf. Start reading about proper etiquette with Manners Can Be Fun - and you will not make a mistake. There's no better way to learn - than with a smile on your face.